German Andres Márquez … resides in San Felix, Bolivar, Ven., one of the largest states in the country...Son of German Márquez and Oniela Rojas … has an older sister, Hendymar Márquez, and a younger brother, Geremia Márquez...Enjoys spending time with his family and going to the beach...Has been playing baseball since the age of five...Twitter handle is @germanmarquez5. Made his first Opening Day Roster and led all Major League rookies with 14 quality starts and 147 strikeouts...Went 11-7 with a 4.39 ERA (162.0 IP, 79 ER), 49 walks and 147 strikeouts in 29 starts … his 11 wins were tied for first among all Major League rookie pitchers (also: Kyle Freeland)...Recorded six consecutive quality starts from July 7 to Aug. 8 … per Elias, it is the longest such streak by a Rockies rookie (previous: five quality starts, four times; last: Kyle Freeland from April 23 to May 16, 2017)...Courtesy of Elias, became the first rookie in Rockies history to record at least nine strikeouts in each of three consecutive games in a single season, July 17-29 (9,9,10)...Pitched a career-high eight shutout innings, with six no-hit innings, on May 10 vs. Chicago-NL … allowed a double to Kris Bryant in the top of the seventh to break up the no-hitter...Named to the Topps All-Star Rookie Team, the second pitcher in franchise history to be named to the team (also: Jason Jennings, 2002). Made his Major League debut on Sept. 8 at San Diego, where he allowed two hits and three runs in 2.1 innings pitched...Went 1-1 with a 5.23 ERA in six games (20.2 IP) with the Rockies...Made his first big league start on Sept. 21 vs. St. Louis, where he also recorded his first Major League win to become the second-youngest Rockies pitcher to earn his first career win at 21 years, 212 days of age (youngest: Jamey Wright, July 17, 1996 vs. San Francisco at 21 years and 206 days of age)...Spent most of the 2016 season as a member of the Hartford Yard Goats, where he went 9-6 with a 2.85 ERA (135.2 IP, 43 ER) in 21 starts … his 126 strikeouts were second-most in the Eastern League and he was named 2016 Double-A Eastern League Pitcher of the Year. Made 26 appearances with 23 starts for High-A Charlotte, going 7-13 with a 3.56 ERA (139.0 IP, 55 ER)…Walked 29 batters with 104 strikeouts, tied for sixth-most in the Florida State League…Went 2-2 with a 0.72 ERA (25.0 IP, 2 ER) in five appearances, four starts, in May, including a seven inning, two-hit shutout vs. Tampa, May 22…Made consecutive relief appearances April 30 and May 5 and a third Aug. 5, going 0-1 with a 3.00 ERA (9.0 IP, 3 ER) … surrendered all three earned runs over four innings in his first relief appearance, April 30 at Fort Myers…Pitched six or more innings 12 times, recording a quality start in all 12 outings … pitched seven or more innings five times, eight innings once. July 27, 2018 Colorado Rockies activated RHP German Marquez from the restricted list. 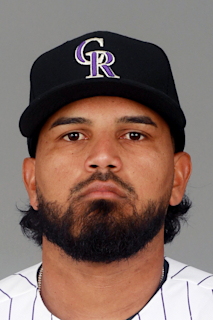 July 25, 2018 Colorado Rockies placed RHP German Marquez on the restricted list. July 22, 2018 Colorado Rockies placed RHP German Marquez on the paternity list. October 5, 2017 Colorado Rockies activated RHP German Marquez. October 4, 2017 Colorado Rockies reassigned RHP German Marquez to the minor leagues. April 25, 2017 Colorado Rockies recalled RHP German Marquez from Albuquerque Isotopes. April 9, 2017 Colorado Rockies optioned RHP German Marquez to Albuquerque Isotopes. September 6, 2016 Colorado Rockies recalled German Marquez from Albuquerque Isotopes. August 10, 2016 RHP German Marquez assigned to Albuquerque Isotopes from Hartford Yard Goats. March 18, 2016 Colorado Rockies optioned RHP German Marquez to Hartford Yard Goats. January 28, 2016 Tampa Bay Rays traded LHP Jake McGee and RHP German Marquez to Colorado Rockies for LF Corey Dickerson and 3B Kevin Padlo. November 20, 2015 Tampa Bay Rays selected the contract of RHP German Marquez from Charlotte Stone Crabs. April 6, 2015 RHP German Marquez assigned to Charlotte Stone Crabs from Bowling Green Hot Rods. July 6, 2014 Bowling Green Hot Rods activated RHP German Marquez from the 7-day disabled list. June 25, 2014 Bowling Green Hot Rods placed RHP German Marquez on the 7-day disabled list. March 30, 2014 RHP German Marquez assigned to Bowling Green Hot Rods from Princeton Rays. June 18, 2013 RHP German Marquez assigned to Princeton Rays. May 12, 2012 RHP German Marquez assigned to VSL Rays. July 6, 2011 Tampa Bay Rays signed free agent RHP German Marquez to a minor league contract.